The Pedernales River courses 106 miles through the heart of Texas Hill Country. 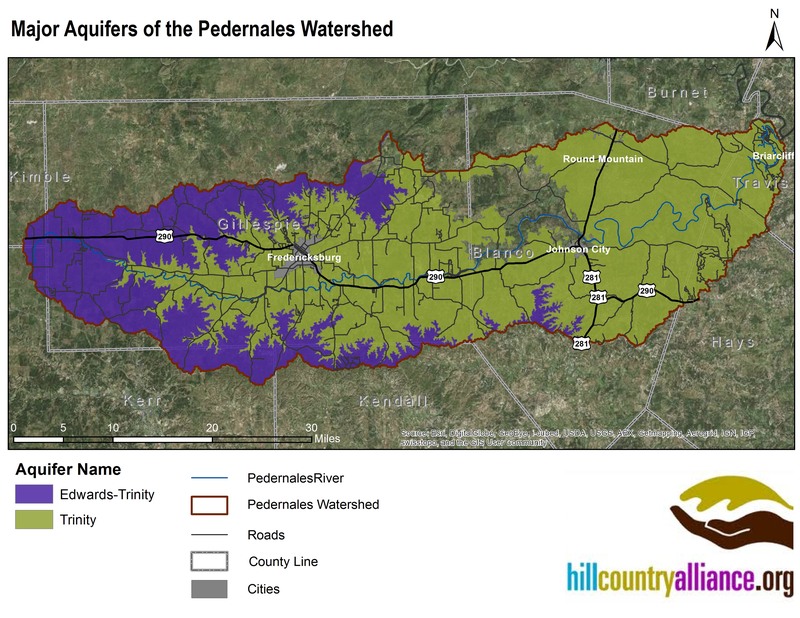 From its headwaters just west of Harper, through Gillespie County, Fredericksburg, Stonewall and Johnson City, and on to Lake Travis and the Colorado River, the Pedernales watershed represents the diverse culture, hydrology and landscape of much of the greater Hill Country region. The river basin features a high level of biodiversity, including endemic species such as the Pedernales River springs salamander and the Guadalupe bass, Texas’ state fish. The diverse habitats across the basin support a variety of species of conservation concern, including canyon mock-orange, swamp rabbit, and breeding populations of federally endangered black-capped vireo and golden cheeked warbler. The Pedernales River basin also supports a budding wine industry that is quickly becoming a significant tourist draw. Riverside parks including the LBJ Ranch, the Pedernales Falls State Park, West Cave Preserve and Milton Reimer’s Ranch Park attract hundreds of thousands of visitors each year, and the cities of Fredericksburg and Johnson City offer diverse cultural, historical and recreational opportunities. Rural agriculture and ranching still make up the majority of land use in the basin, and hunting provides a critical source of income for many landowners. The landowners of this Hill Country river basin are motivated to protect these natural and cultural resources for future generations. 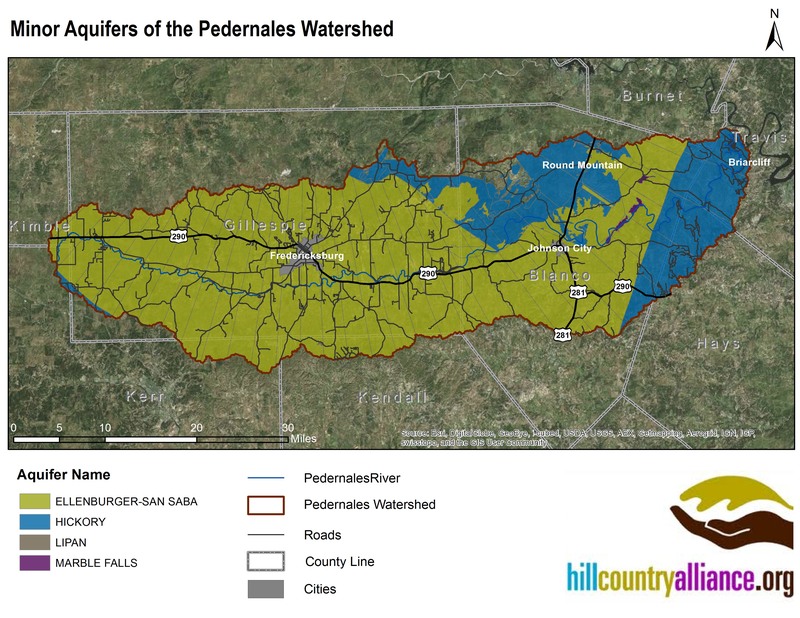 In 2013 HCA initiated the Pedernales Program in an effort to support those networks. We are bringing partners together, connecting landowners to information and technical guidance, and facilitating collaboration. This webpage will serve as a one-stop resource for information, news and events occurring within the basin. Check back regularly for the latest updates, and to learn how to get involved. The Pedernales River is more than 100 miles long- but its tributary system includes more than 3,000 miles of creeks and streams. These tributaries provide critical base flow to the main river. It is widely understood that our rivers and groundwater systems are intimately connected, and our understanding of the boundaries of those systems is increasing. Unfortunately we manage our natural resources along political lines, rather than hydrologic lines. 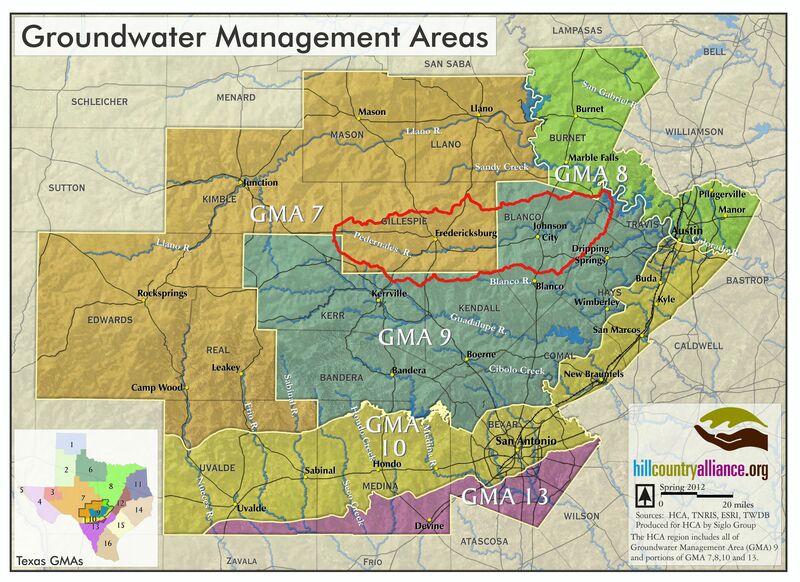 This map shows the Pedernales Basin, overlaid with the Groundwater Management Areas. 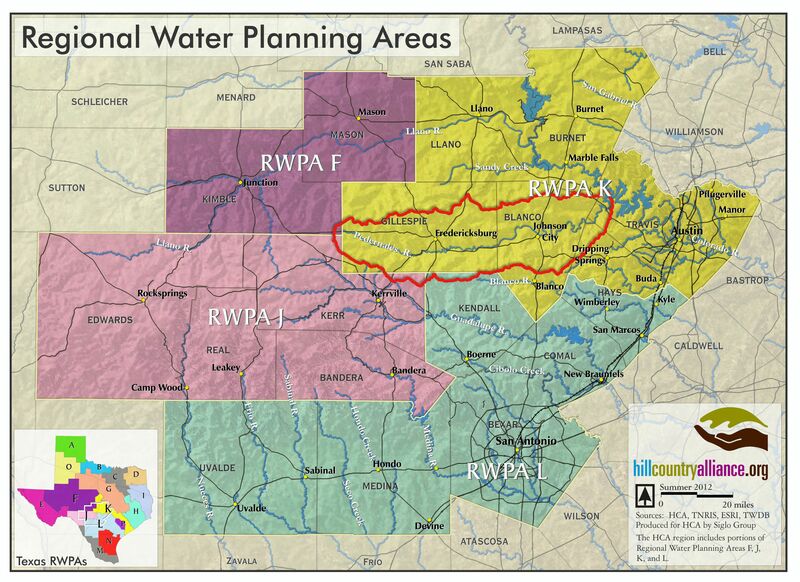 Like Groundwater Management Areas (GMAs), Regional Water Planning Areas (RWPAs) follow political, rather than hydrologic lines. This often results in dramatically different water management decisions across the same basin. 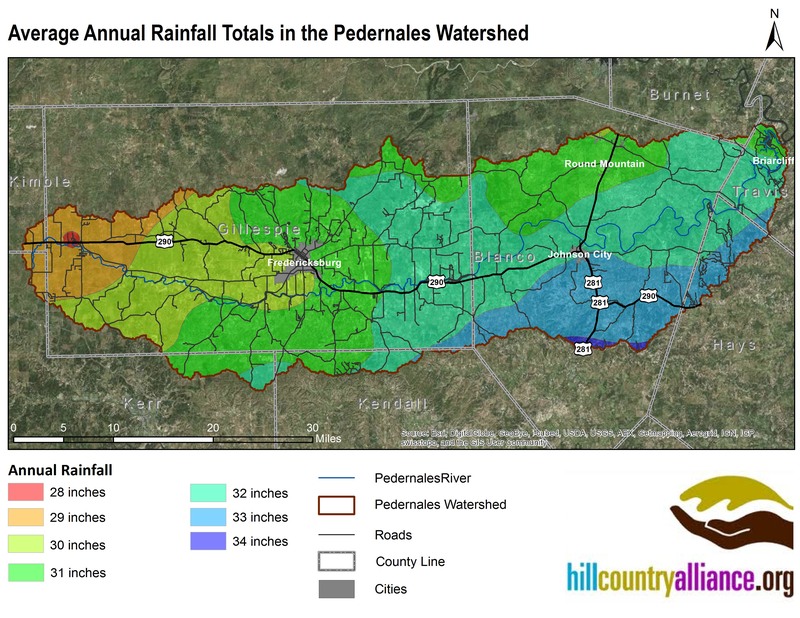 Most of the Pedernales falls into Region K.
The average rainfall totals across the Pedernales vary from 28 inches in the westernmost portions of the basin to 34 inches in the east. 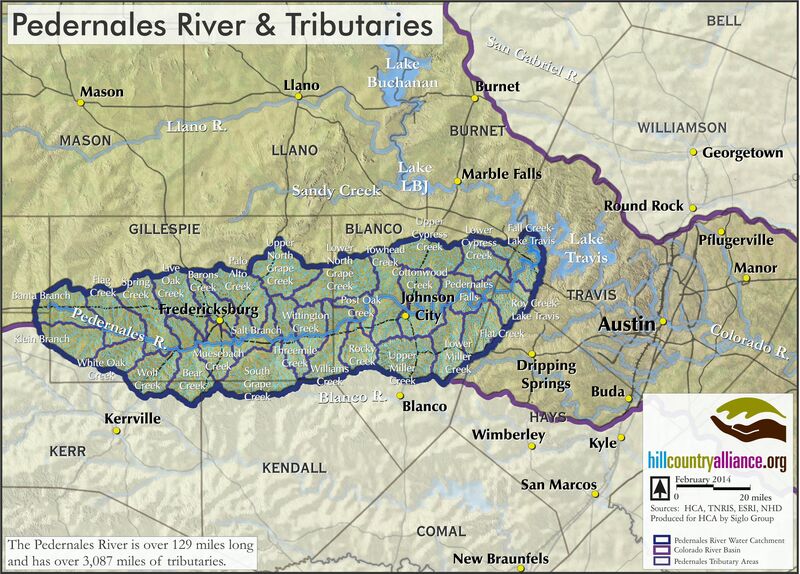 The major aquifers underlying the Pedernales are the Edwards-Trinity in the western portion of the Basin and the Trinity in the eastern portion. During an average rainfall year the watershed contributes 72,000 acre feet of water to these aquifers. In addition to the Trinity and Edwards-Trinity, minor aquifers that are more limited in geographic extent can be found throughout the watershed. These include the Ellenburger-San Saba and the Hickory.